Since the group started in July 2012, we have only cancelled two walks. Both of these were this year and both were cancelled after the leader and a few walkers had turned up. 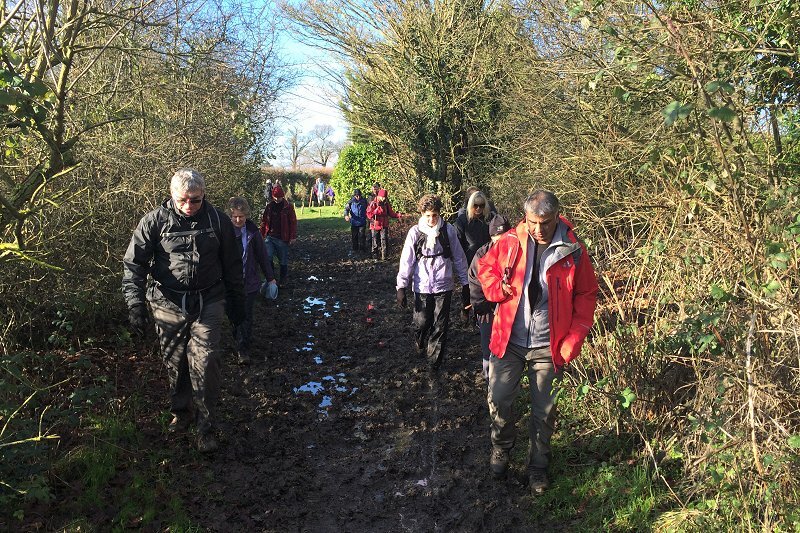 Walk leaders have a duty of care and it is up to their discretion to cancel a walk if they feel the conditions are unsuitable or will become unsuitable before the walk is over. If the leader discovers the route has become unusable before the walk takes place then we are usually able to swap walks around in the programme, and this is what we did with this week's walk. 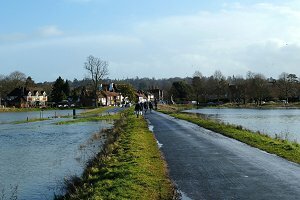 News of the Thames breaking its banks at Cookham arrived in time for us to swap the Maidenhead/Thames Path, originally scheduled for this weekend, with this walk from Hook. Eighteen walkers turned up at Hook on Saturday 12th January on a rather cold and cloudy day. Thankfully everyone had received the news about the last minute change of plan and nobody turned up in Maidenhead. Crossing the River Whitewater for the first time on our route. 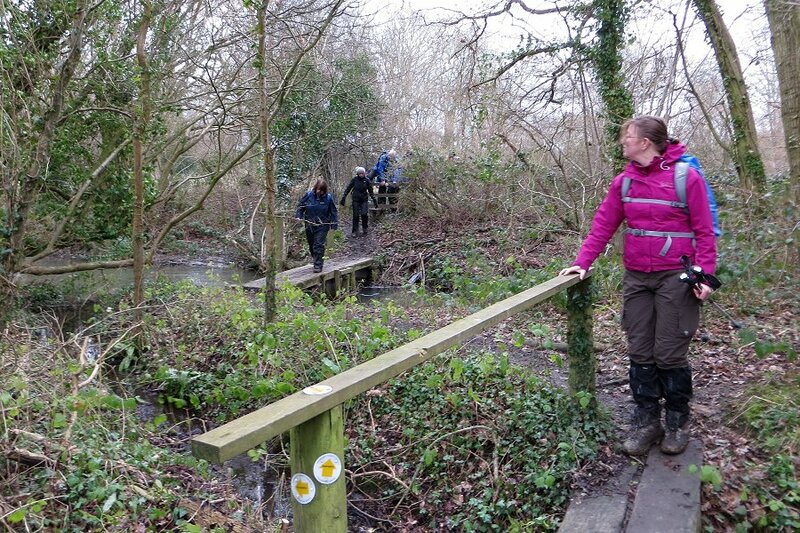 I was leading this walk and was fairly sure we wouldn't find any flooding on our route, but I was expecting it to be rather boggy in places. It was; but not enough to sabotage our planned route. We set off from Hook railway station, which was eerily quiet as no trains were running today due to engineering works. We walked southward and out of the village into Bartley Heath. This was as muddy as expected but didn't present a problem to us until we found a stream crossing the footpath. There wasn't a bridge but it was shallow enough to wade through. Emerging from the woods, we followed a lane that took us north, past the edge of Hook. Crossing the A30 by the Crooked Billet pub, we continued north through open fields, roughly following the course of the River Whitewater. 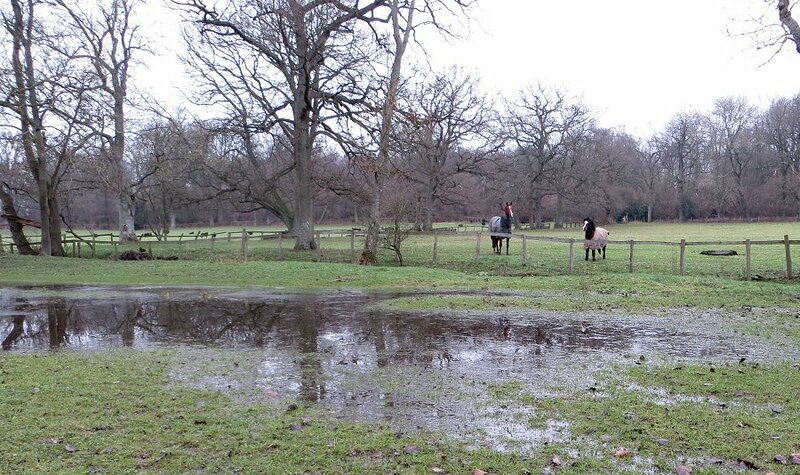 A waterlogged field near Borough Court, just north of Hook. The ground was quite waterlogged and in some cases the water was frozen. We crossed the river on a wooden bridge, crossed a field and walked past a lovely old house at Borough Court where one of the residents told us that the field we'd just crossed had been totally submerged a few days before. 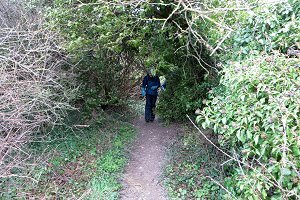 From there we headed east to West Green House, which we circumnavigated and then headed west and uphill to Damale's Copse. It was a little after 12pm and so we decided to stop for our picnic lunch while we were still on high ground and we could sit down without getting wet. Crossing the River Whitewater for the second time on our route. After lunch we descended to the Whitewater and crossed it again on another wooden bridge. Again the water was high but not high enough to wet the bridge. Following the river for a short way, we left it to head west towards Stoker's Farm and then crossed the B3349 Reading Road on a rather awkward corner. Taking a diagonal route across a field and then through woods we emerged onto Hook Road, which connects Hook with Rotherwick. 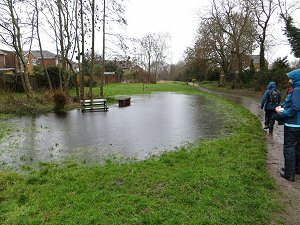 My original plan was to cross this road and follow the footpath opposite but this had be waterlogged when I did the recce for this walk before Christmas so there was no possibility of going that way now. Instead we walked along the road for a short distance before taking a more substantial byway, which joined up with a footpath that took us into Rotherwick. A group photo taken with Tylney Hall visible in the background. We stopped at the Coach and Horses pub for a drink before continuing our walk. The pub was rather full, mostly with people enjoying what looked like an excellent Sunday lunch, so we decamped to the picnic tables outside. Leaving the pub, we headed west and then south across Tylney Park golf course, taking care not to get in the way of any golfers or any low-flying golf balls. Continuing south, past the back of Tylney Hall, we reached the hamlet of Newnham. Crossing the village green we took another footpath heading east, which took us through a farm and back into Hook. A short piece of road walking took us back to the railway station, where we had started our circular walk. See our route on Bing Maps. I didn't make it to this walk but Tim, the walk leader, has written it up for us and provided some photographs. 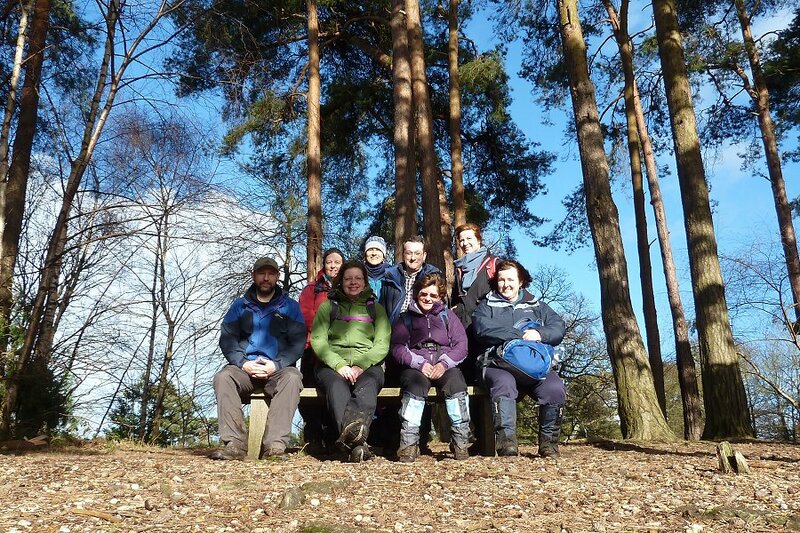 Also Julia, who joined the group very recently, was on this walk and has also provided some photos. 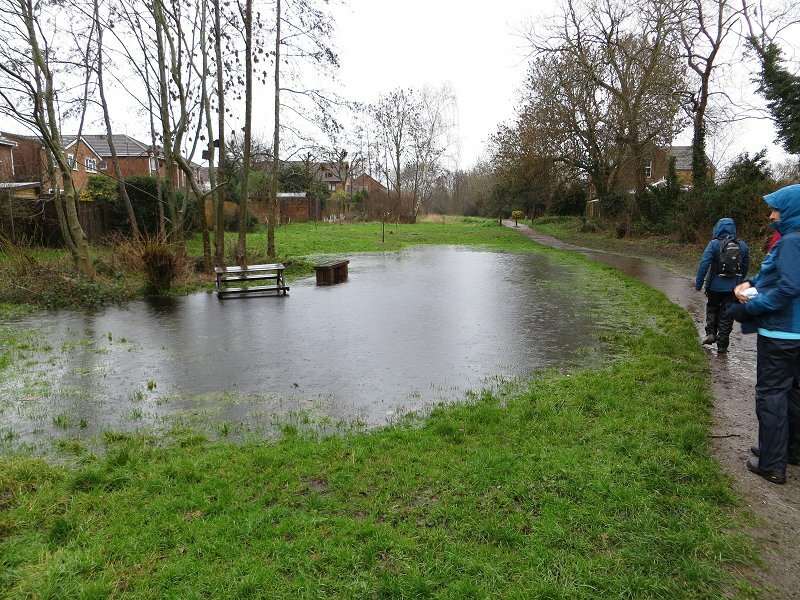 A flooded path south of Waltham St Lawrence and west of Shurlock Row. 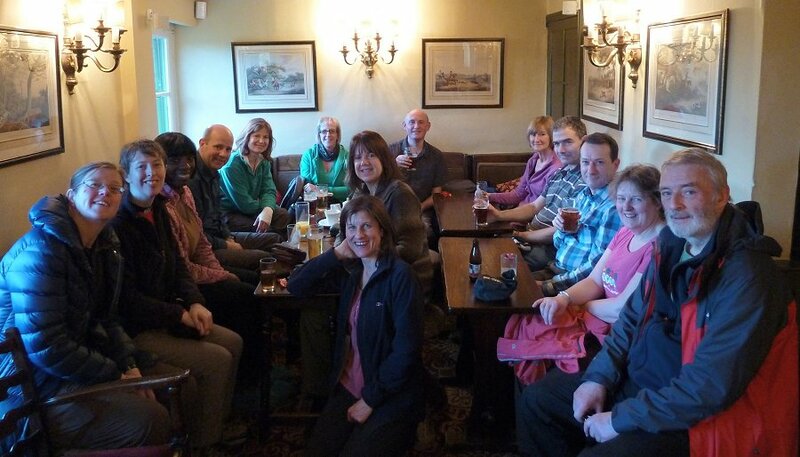 On Sunday 19th January, twenty-six of us turned up for this short walk around Waltham St Lawrence. There were plenty of new faces, visitors from other groups and a number of members we hadn't seen recently. Great to see everyone. The weather gave us a welcome break, providing lovely sunshine for the whole walk, which was a welcome relief from the constant rain we have encountered over recent weeks. A muddy path at West End, between Waltham St Lawrence and Shurlock Row. However we knew the ground would be well soaked from previous rainfalls and were prepared for a muddy walk over sodden ground. We met outside the pretty Bell pub (c 1608) in Waltham St Lawrence and set off south in the direction of West End, proceeding across our first waterlogged field. It wasn't too bad as long as we kept up a zigzag pattern avoiding the major puddles, however more was to come. 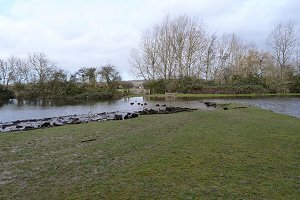 The Pond in Shottesbrooke Park, between Waltham St Lawrence and White Waltham. We continued south towards Hungerford down lanes and bridleway in the lovely sunshine before hitting a very muddy field, which was made worse after the owner had created a fenced paddock, forcing us down a narrow passage of deep mud. 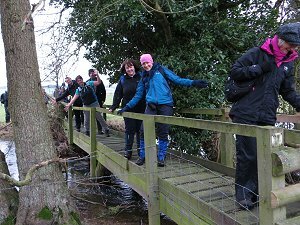 Our walkers performed splendidly using the fence as balance and support. We didn't lose a single boot in the mud! The remaining path south continued to offer challenges at one stage being completely submerged, but no one succumbed to an early bath. The Church in Shottesbrooke Park, between Waltham St Lawrence and White Waltham. After reaching Hungerford we turned north to initially better conditions before hitting a challenging bridleway, which tested our ankle flexibility to the full. Thereafter it was fairly plain sailing on the Knowl hill circuit before reaching the pretty area of Shottesbrooke park and associated church. We finally turned back West crossing pretty woods and fields before arriving back in Waltham where a number of us enjoyed drinks in the courtyard garden of the Bell pub sitting in lovely sunshine. 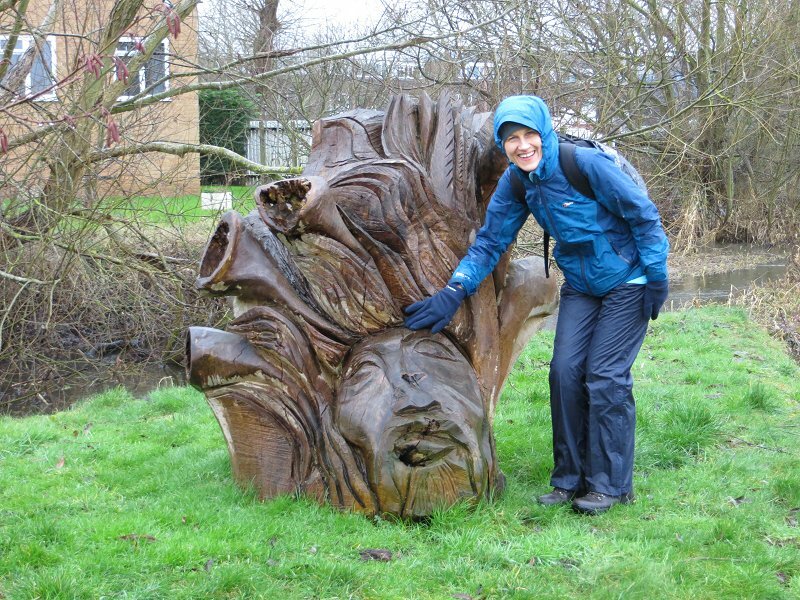 One of a number of carved heads along the Green Way path. 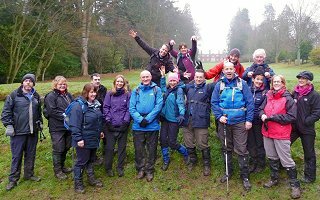 Seven of us turned up in Maidenhead on Sunday 26th January despite the unpromising weather forecast. The rain was already falling as we assembled at the start point of the walk but it eased up by the time we set off. Christine, our leader, had spent Friday rechecking the route to make sure that it was passable after the recent wet weather. A couple of detours were required in town, due to subways and underpasses being flooded, before we could start to follow the Green Way to Cookham. The Green Way is a waterside corridor through Maidenhead that connects Cookham and Bray. We followed the Green Way north from Maidenhead to Cookham. 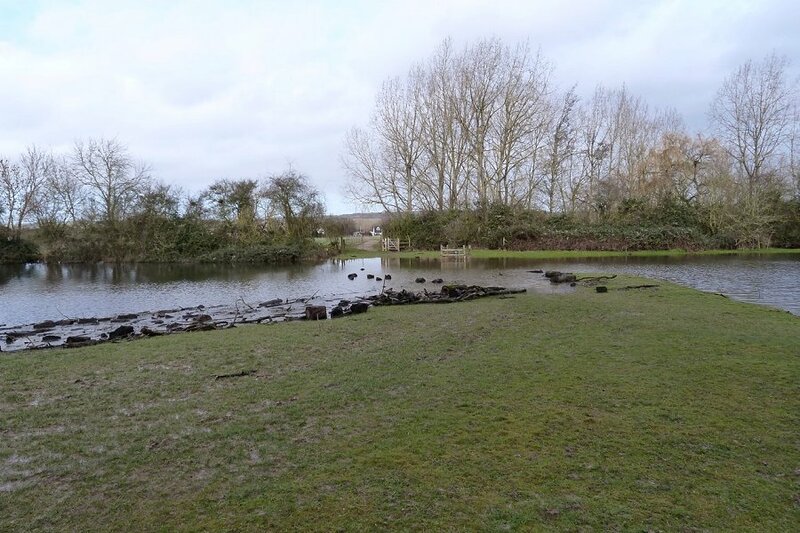 One of a number of flooded areas along the Green Way path. On the way we saw a number of partly flooded fields and paths. 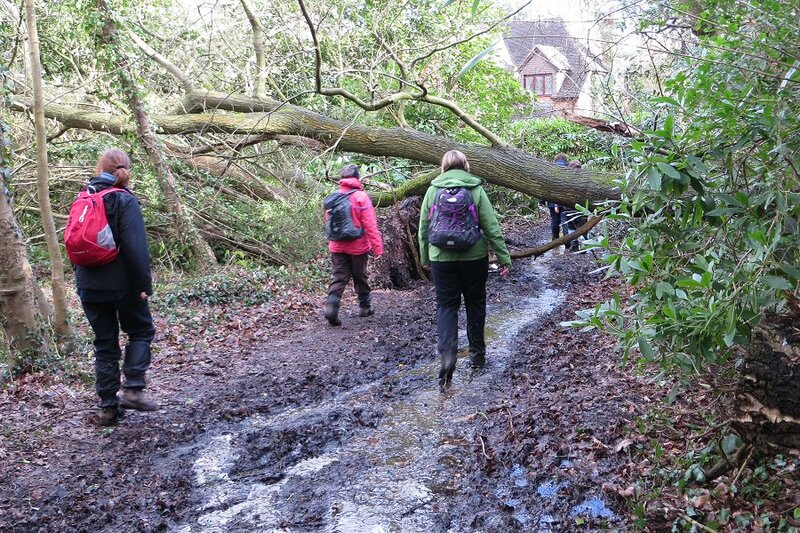 It goes without saying that some of the paths were very muddy! Nonetheless our progress wasn't hampered much by the state of the ground and we made it to Cookham in good time. We stopped off for our picnic lunch in a small green with a couple of handy benches to sit on. 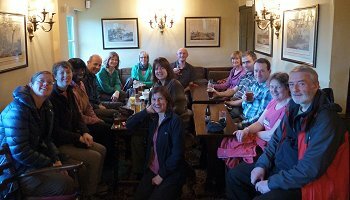 After the picnic, we popped into The Crown pub for a drink. While we were enjoying the comfort of the pub, the weather was changing from a light drizzle into heavy rain. This didn't let up for the rest of the walk. From Cookham, we headed east until we reached the River Thames and then followed the Thames Path southward back to Maidenhead. The quality of the footpath improved as we approached the weirs at Boulter's Lock and it was a proper pavement from there to the centre of Maidenhead. A delightful water feature on the Thames Path in Maidenhead. Instead of contending with mud, we had to dodge the bow waves from cars driving through deep puddles beside the pavement, although by then our waterproofs had already been fully tested by the rain. The Thames Path is quite picturesque as it passes through Maidenhead. At one point we passed a delightful water feature, although most of us had seen enough water already to be delighted in any way. We left the Thames as it passed under a railway bridge and completed our walk by following a few roads back into Maidenhead. Ironically the rain stopped at the end of the walk and the journey home was accompanied by sunshine. You can see our route on Bing Maps. Getting our breath back after our first hill. 300ft of ascent in in less than ½ mile. Sunday 2nd February was a sunny day with blue skies, fluffy white clouds and no sign of rain. 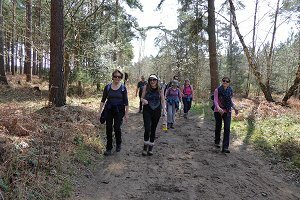 Nineteen of us, including several newcomers, turned up in Hambleden to find that two other Ramblers groups were also doing walks from the same starting point. Parking was tricky! 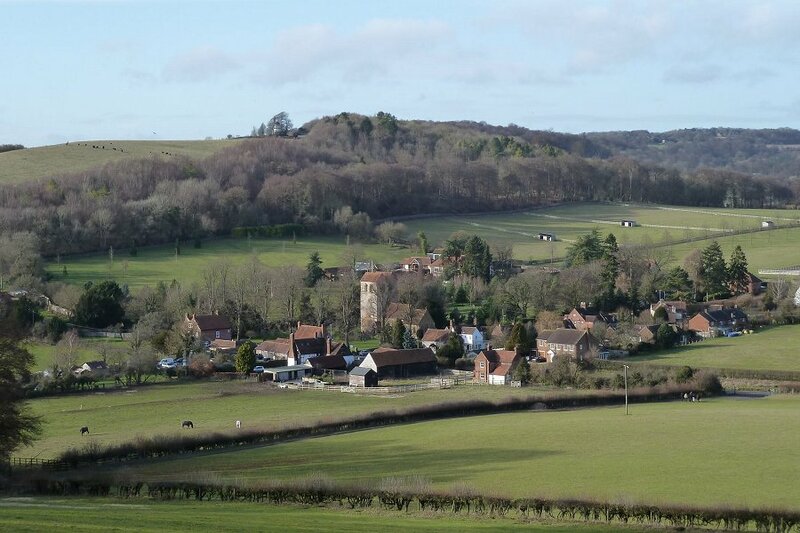 We started off by climbing quite a steep hill heading east from Hambleden. 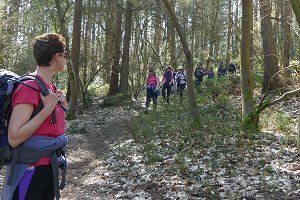 This woodland path had 90m (300ft) of ascent in 750m (less than ½ mile) distance, which certainly got the cardiovascular system working! A view of Fingest village from the hill at Ponyat's Farm, Skirmett. Stopping for a breather at the top, we turned north past Hutton's Farm before descending 75m (250ft) to the little village of Pheasant's Hill. Then it was uphill again, through woodland, heading north-east to Parmoor, gaining 110m (360ft) of height en-route. 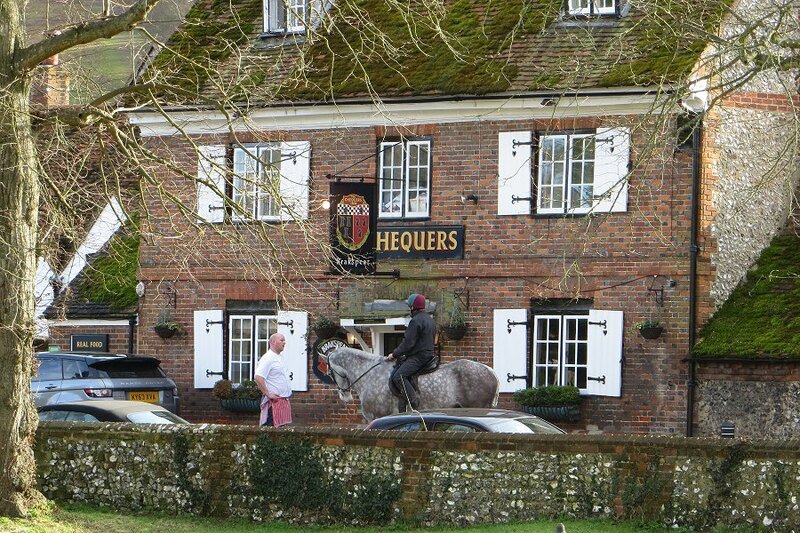 The chef at the Chequers chatting to a passing horse rider. On the way up, we passed another group of walkers coming down. They had already been to Fingest and had had tea and cake at the church. Downhill again, we joined the Chiltern Way and followed it to the village of Turville (where The Vicar of Dibley was filmed, along with various other TV programmes and films). We stopped for our picnic lunch in a sloping field with the village at the bottom and Cobstone Windmill (as seen in the film Chitty Chitty Bang Bang) at the top. After lunch we followed the Chiltern way to the next village of Fingest. Here we popped into St Bartholomew's church for tea, coffee and home-made cake. Enjoying hot drinks and home made cake in St. Bartholomew's Church, Fingest. The local church group had baked an impressive selection of delicious cakes and biscuits, which they were selling with a cup of tea or coffee, to raise money for maintaining their Norman church. After our very pleasant tea break we continued with our walk. Guess what? Another hill! We ascended 80m (260ft) through Fingest Wood and then descended 90m (295ft) back into Skirmett. By now, some of us were beginning to feel like human yo-yos! 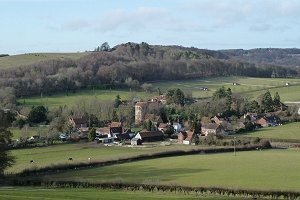 The rest of the walk was more-or-less due south along a gently descending path back to Hambleden, which took us past Arizona Farm, Colstrope Farm and Pheasant's Hill. Having a well earned drink at the Stag and Hunstman in Hambleden. The route we took today was a figure-of-eight with Skirmett in the middle, and included a generous amount of hill climbing. I think we did about 380m (1250ft) of ascent and presumably the same amount of descent. I certainly feel no guilt about indulging in tea and cake on this journey. See our route on Bing Maps. It's rare for our walks not to include a pub stop along the way. 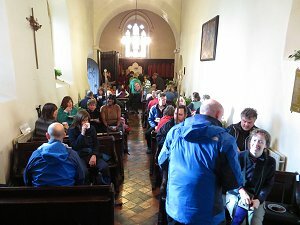 Although there was a choice of tea and cake at the church or a pint at the Chequers in Fingest, the whole group went for the tea and cake option. However, the walk ended right in front of the Stag and Huntsman, which had recently been renovated. It seemed rude not to pop in for a pint, and it was good to sit down after all that exercise! 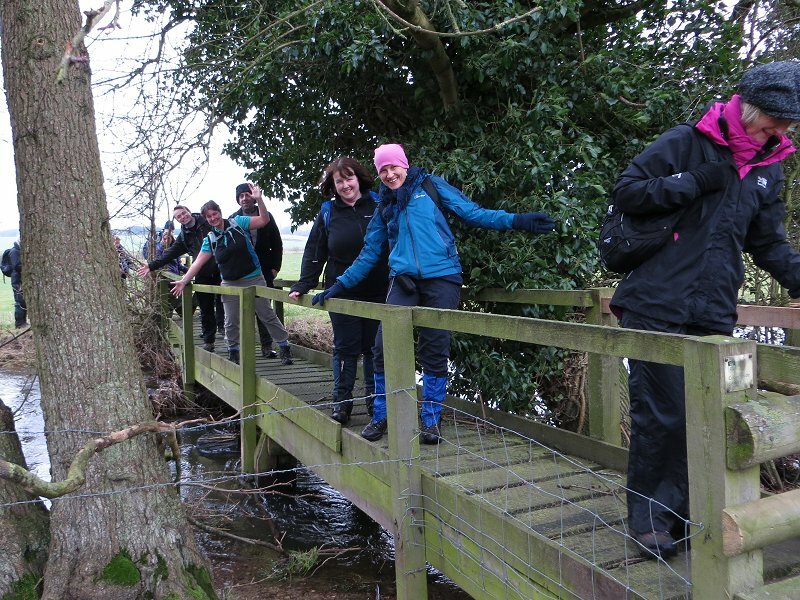 I didn't make it to this watery walk but Julia, one of our newer members who is also a keen photographer, was there and has written up the walk for us. Cookham Moor. The car park is somewhere on the left! 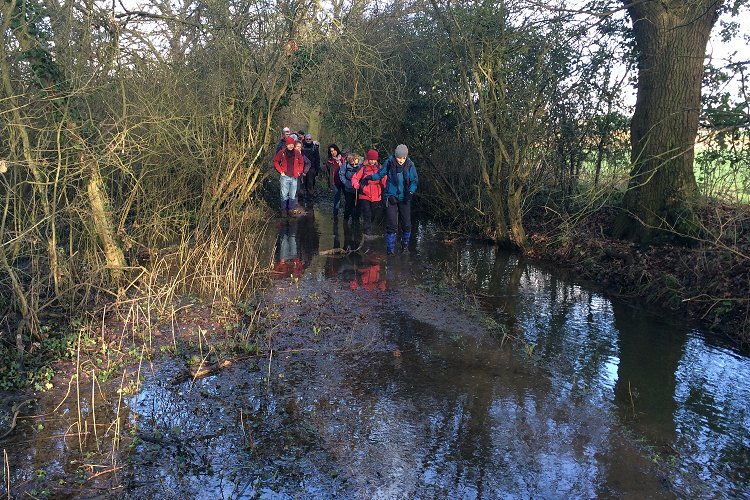 On Saturday 8th February five intrepid walkers, including a first timer with the group, turned up for this walk, despite an uncertain weather forecast and that the planned meeting point (Cookham Moor Car Park) was under floodwater! The start of the originally planned route from Cookham Moor. Luckily we managed to find our walk leaders Mark and Julie on the foot road that leads to Cookham High Street and set off on a slightly modified start to the route. This led us alongside flooded meadows with the Thames itself and the Thames path indistinguishable such was the expanse of water in places. The Thames Path near Cookham. You can see why a detour was needed. The paths we followed were remarkably walkable despite some inevitable mud and views towards the river were superb. 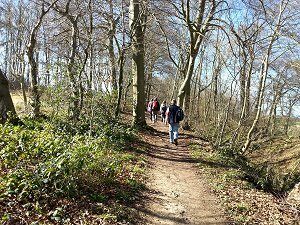 We soon joined the planned route and progressed up towards Winter Hill, traversing part of the Golf Course before heading into attractive woodland. A nice dry spot for a picnic in the woods on Winter Hill. 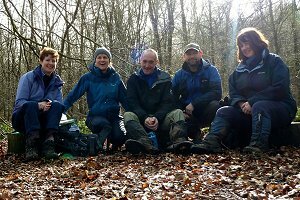 Here we spent an enjoyable lunch stop sat on little wooden ‘seats’ made from a tree trunk with sun streaming through the trees on to our backs. We then progressed through the woods and across muddy fields towards Cookham Dean encountering a few minutes of hail and rain along the way. 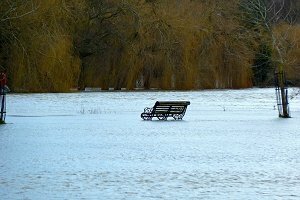 Is there a road under the water? You can see signposts poking out of the water. Fortunately we soon arrived at the Jolly Farmer Inn - a delightful cottage style 18th Century building - where we stopped for some well-earned refreshment. We then stepped back out to fine weather once more and completed the last leg of this enjoyable walk back through the Winter Hill golf course to our finish at Cookham. Some people who attended that walk have told me what a lovely walk it was and how it would be really nice to repeat it (taking the originally planned route) once the Thames has returned to normal. One of the many fallen trees we saw on our walk. 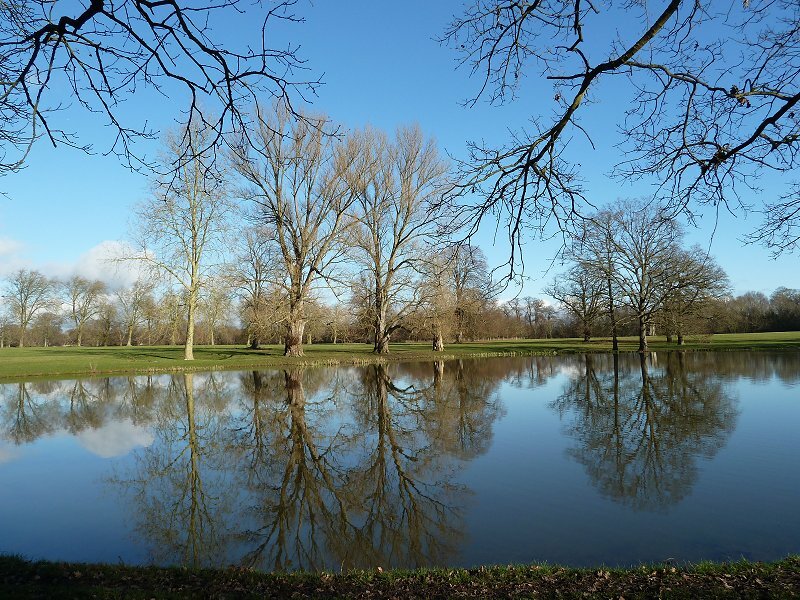 After Friday night's storm, Saturday 15th February was a relatively nice day. Still a bit windy but with some sunshine and only the occasional shower. On the way to the walk I had to dodge a few fallen bits of tree and some large puddles in the road, and there were more obstacles to come on the walk. Eight of us (six regulars and two who have just started walking with us) assembled outside the Post Office in Crowthorne and compared accounts of the previous night's weather before starting the walk. Our leader, Sue, told us that her electricity had cut out during the storm and not yet been restored. Stopping for a drink at the Queen's Oak pub, Finchampstead. We set off south, following a path that ran parallel to the railway line until it intersected the Three Castles Path (a long distance path from Windsor Castle to Winchester) which we joined and followed going west over a the railway line towards Ambarrow Farm. Here the Three Castles Path heads south past Horseshoe Lake follows the course of the River Blackwater to village of Finchampstead, and this had been the intended route for today's walk. However, this year's incessant heavy rain and the consequent high river levels meant that this part of the path was somewhat submerged, so we took a diversion along a road that ran across the north of the lakes. 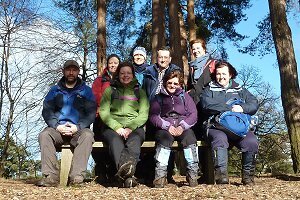 A group photo taken in Finchampstead Ridges. Although the road was on higher ground it was not without some obstacles. Several fallen branches and a tree had blocked the road, but there were already people at work with chainsaws clearing the way. We left the road as it approached Finchampstead and took a footpath that circumnavigated the village and emerged by the church. We stopped for our picnic lunch in the little green between the church and pub. 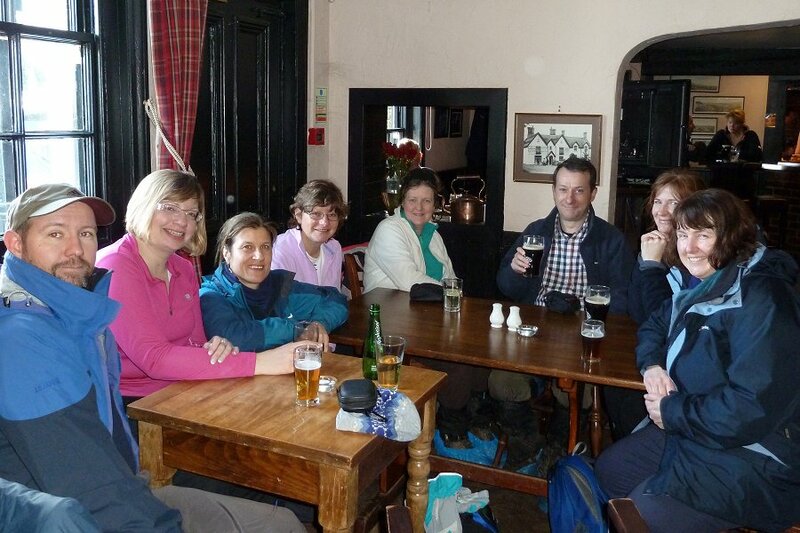 After lunch we went straight to the pub for a drink before carrying on the walk, heading north-east through Church Farm. This path eventually arched round to head south toward North Court Farm. Walking around Heath Pond in Simons Woods. 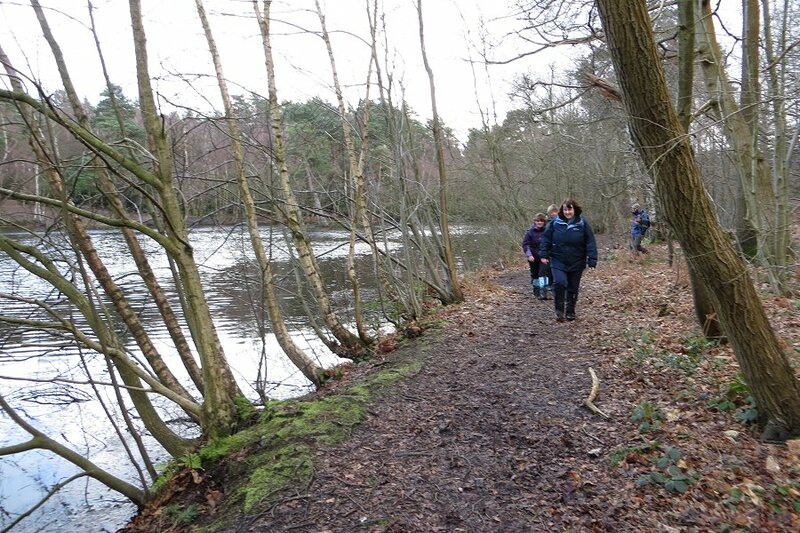 A short bit of road walking took us to the bottom of Finchampstead Ridges, a wooded common with lots of ups and downs. 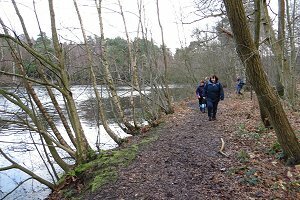 We emerged at the top of the ridges, crossed the road and continued north into Simons Woods where we skirted round Heath Pond and finally followed a very straight (and very muddy) path back to Crowthorne. See our route on Bing Maps. Arriving back in Crowthorne, we were invited by Sue for tea and home-made cakes at her house. (The tea and coffee being conditional on her electricity supply being restored.) Although some of the group had other plans for the afternoon, a few of us were able to accept this kind and unusual invitation. A very pleasant way to round off a good walk. 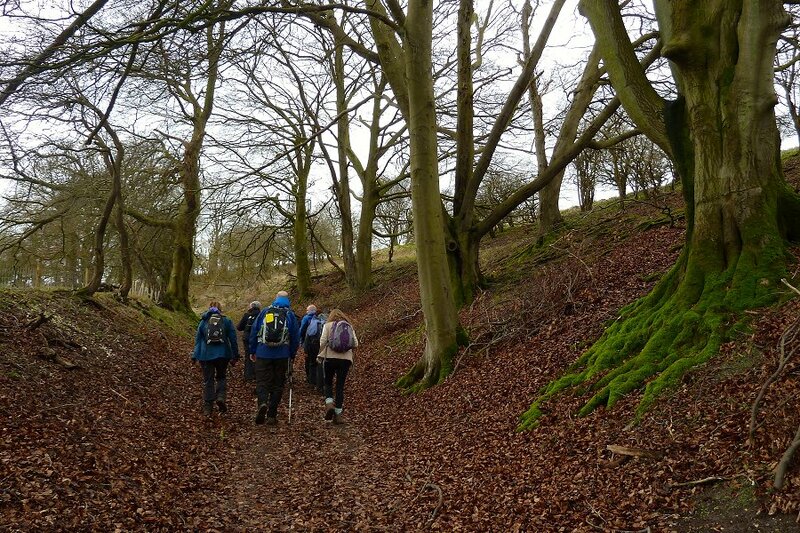 Ascending a rather windy Cottington's Hill. The Wayfarer's Walk is visible in the background. 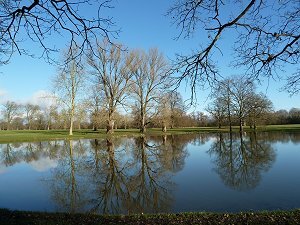 On Sunday 23rd February we should have been walking around Pangbourne, but the swollen Thames put a stop to that, so instead we chose to walk on the North Hampshire Downs - well away from the Thames Valley. Thirteen people turned up at the car park on White Hill, near Watership Down, to be greeted by strong winds and fine drizzle. The walk started by heading up Cottington's Hill where the Hannington transmitter mast radiates digital television to North Hampshire and Berkshire. One of several fallen trees and bushes creating obstacles on our route. Skirting past the transmitting station, we then took a diagonal path down the steep slope of Freemantle Park Down and on to the gallops that belong to Park House Stables, just south of Kingsclere. Down here there was less wind and the drizzle had more-or-less stopped. We followed the public footpath past the gallops to Kingsclere. There we turned west onto Hollowshot Lane, which emerged onto Swan Lane on the southernmost tip of the village. A short bit of road walking took us to another footpath that ran west over Bishop's Hill. From here we had a very clear view of Watership Down, which we would be walking atop on our return. Posing for the camera before having our picnic lunch in Southwood Copse. Another short bit of road walking took us to the fishing lakes at Frobury Farm where there were a few fishermen. The footpath that circumnavigates the fishing lakes is actually lower than the lakes themselves. Needless to say, it was very muddy and slushy. We stopped for our picnic lunch in Southwood Copse where we conveniently found a nice dry fallen tree to sit on. 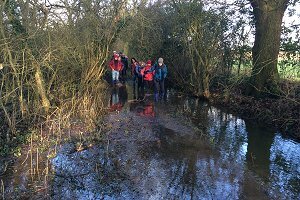 After lunch we continued heading westward to the village of Ecchinswell, taking a slight detour where the footpath had turned into a pond! We crossed a few streams on our way using some simple "plank" type bridges. We crossed those bridges when we came to them, on our way to Ecchinswell. Once in Ecchinswell, we made for the Royal Oak pub, which has recently re-opened under new management. They had a real fire going in the bar and a selection of local ales. While studying the map and supping my pint, a local rambler came over for a chat. He seemed to approve of our chosen route. Avoiding the tremendous temptation to linger for longer in the cosy confines of this pleasant pub, we drained our drinks and set off south-west to Watership Farm, then south into the picturesque hamlet of Sydmonton. 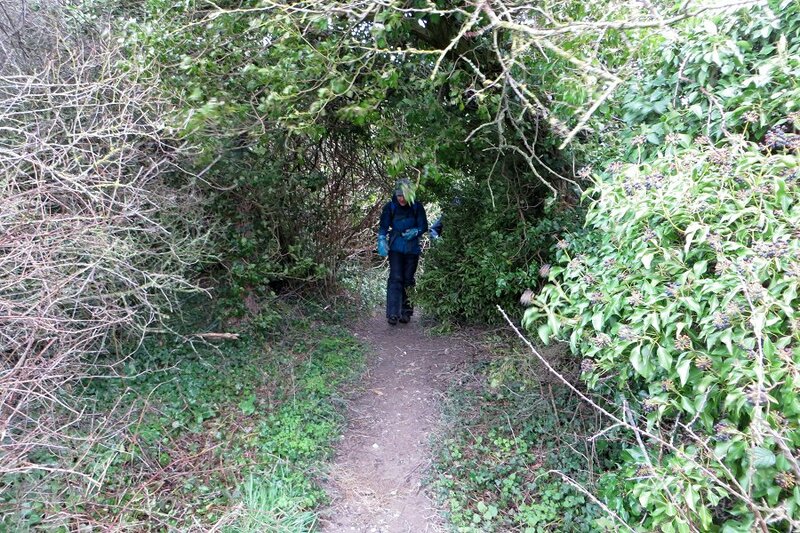 Ascending the wooded tunnel of a path that led us back onto the ridge-way. There must be some rather security conscious residents in Sydmonton as we saw at least half-a-dozen closed-circuit cameras as we walked through, and each one swivelled round to track us as we passed! From Sydmonton, we headed back up on to the ridge-way through a wooded tunnel of a path lined with ancient trees with moss growing on their roots. The path followed the edge of a natural bowl in the land, which was pasture to a number of sheep, and had a farm house at the bottom. As we reached the top of the path, where it joined the Wayfarer's Walk, we were hit by the full force of the wind again, which accompanied us for the rest of our walk. Back on top of the ridge-way by the gallops, feeling the full force of the wind again. We followed the Wayfarer's Walk going east along the top of Watership Down and past some more gallops back to the car park at White Hill. See our route on Bing Maps. As this walk had been a last minute substitution, I hadn't had time to pre-walk the route before leading it. The walk included many paths that I know well around this area, but also included a few that I had never walked on before, so I was concentrating more on navigating and less on chatting today! View east from Streatley Warren. The Ridgeway is on the left-hand side of the valley. Saturday 1st March saw twenty of us, including three newcomers, attend this short walk from Aldworth. 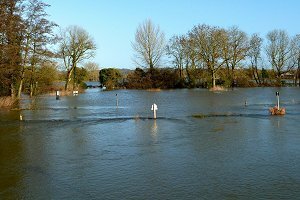 In common with many walks this year, this one was thought up quickly to replace the scheduled walk at Aldermaston Wharf, which was still flooded. Nonetheless it was a very pleasant walk, helped in part by the fine weather, which gave that extra impact the local scenery. Setting off from outside the Bell Inn, we headed north-west along Ambury Road, which led us out of Aldworth and up to the Ridgeway via Streatley Warren. The track crossing the top of Streatley Warren afforded fine views of the valley with a section of the Ridgeway on its northern edge. 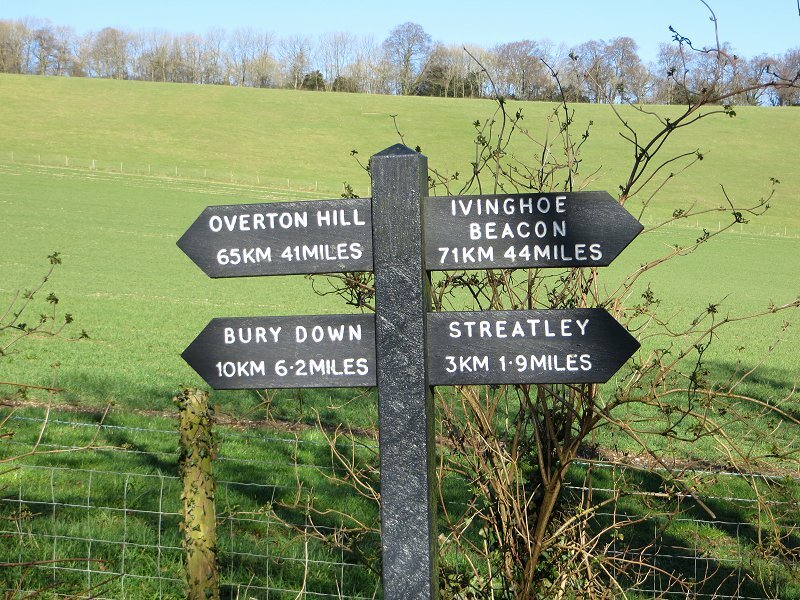 A signpost by the car park on the Ridgeway showing the distances to each end of this National Trail. 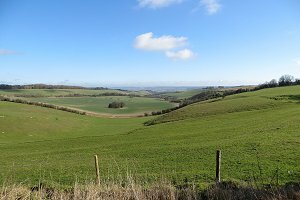 Joining the Ridgeway, we headed east in the direction of Thurle Down and Streatley. This chalky track had frequent views into the valley and gradually descended until we reached a car park at the end of Rectory Road, leading to Streatley. 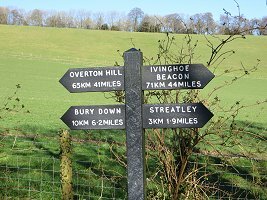 A signpost in the car park informed us how far we were from Overton Hill, near Marlborough, and Ivinghoe Beacon in Buckinghamshire; these points being the start and end of the Ridgeway National Trail. Of the 86 miles of this ancient trackway, believed by some historians to be the oldest road in Britain, we only covered about 1½ miles on this particular walk, but other parts of the Ridgeway feature in many of our walks. Following the track from the Ridgeway to Westridge Green. Turning off the Ridgeway before we reached Thurle Grange, we headed south-east along a well-established track that took us to the village of Westridge Green. This track had a gentle incline until we passed Kiddinton Cottage (farm) and then got considerably steeper as we approached Westridge Green. Stopping to regroup after the climb, we were able to see Streatley in the distance - for the only time on this walk. After a short section of road walking through Westridge Green we were on a footpath that took back into Aldworth, where the walk ended, next to the Bell Inn. See our route on Bing Maps. Needless to say, most of us stopped off at the pub for a post walk drink and the weather was still fine enough for us to sit outside, although now we'd stopped walking we needed to put all our layers back on! 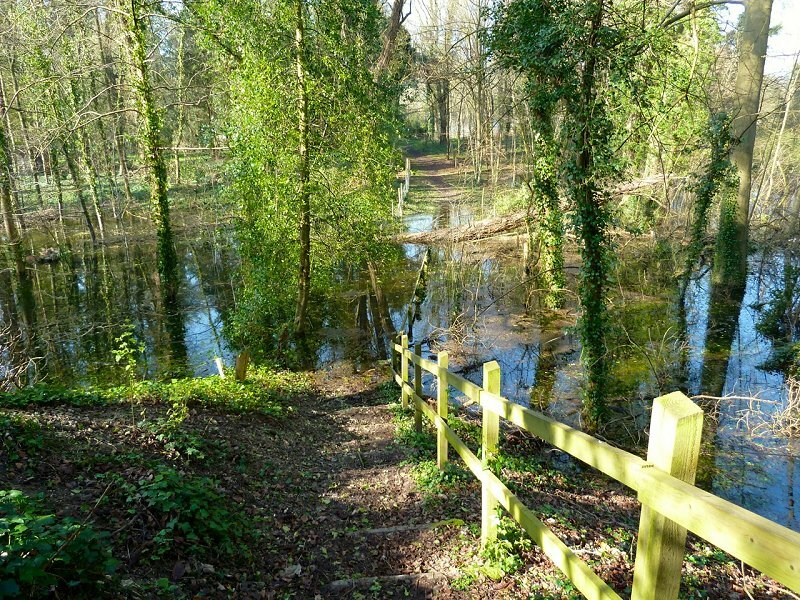 A flooded path near Maidenhead. 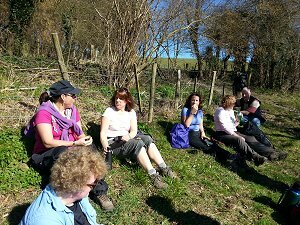 Sunday 9th March 2014 saw 16 of us gather at the car park at Maidenhead Thicket in glorious Spring sunshine for an 8½ mile walk led by Christine. The first task was to decide what to wear and most of us discarded a layer or two - some even paring down to short sleeves! 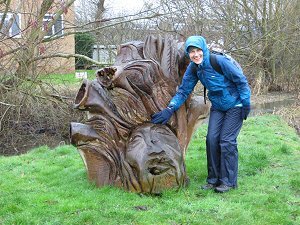 We set off, walking along the southernmost edge of Maidenhead Thicket - at one point needing to take a detour as the path was still flooded due to the prolific rain we had a few weeks back! We then proceeded through farmland before following the Knowl Hill Bridleway up towards Bowsey Hill. A woodland path on the Chiltern Way. Next we followed the Chiltern Way through attractive sun-dappled woodland to our lunch stop near Warren Row where a fallen tree offered us an impromptu seat. 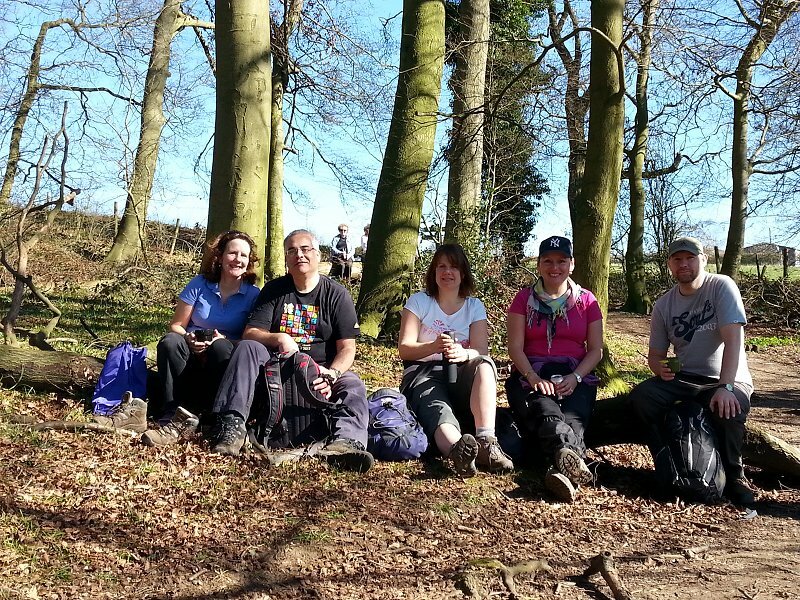 Here we sat munching our picnics and enjoying the warmth before continuing on to Ashley Hill. Along the way there were some splendid signs of Spring – snowdrops (unfortunately now past their best) and masses of golden daffodils as well as delicate white blossom on the trees. Relaxing at the Dewdrop Inn. We made a second detour – this time to the Dew Drop Inn for some liquid refreshment and someone was even tempted by some cheesecake! 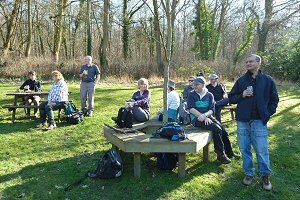 We enjoyed sitting outside at the picnic tables in the sunshine – it could almost have been a summer’s day! 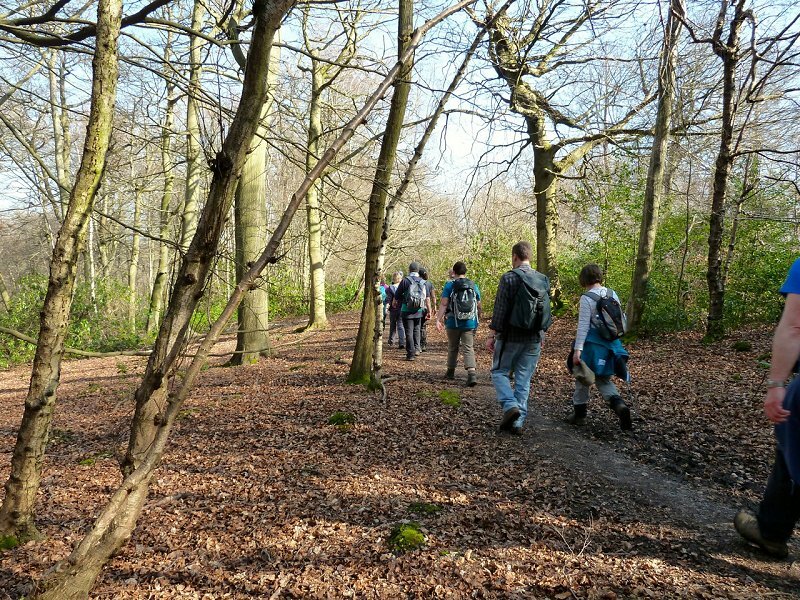 The last leg of the walk took us round the edge of Ashley Hill Forest before passing by Burchett’s Green. 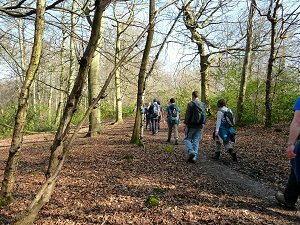 More fields followed – a visual feast of green grass and blue sky - then Robin Hood’s Arbour on the Northern part of Maidenhead Thicket, which led us back to the car park where we had begun. 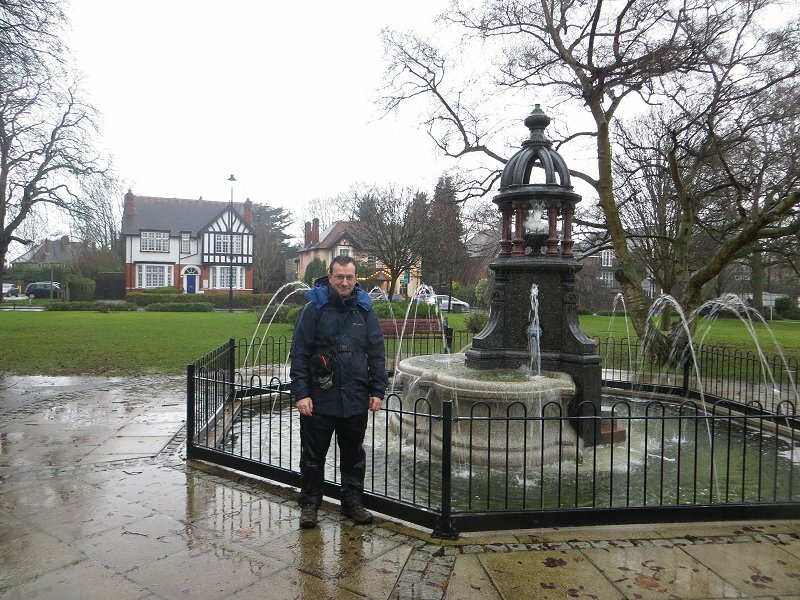 Thank you Julia for the write-up and the photographs of this walk. One of the many ascents on this walk. The weather on Sunday 16th March offered blue skies, sunshine, a gentle breeze and was just about the perfect temperature for walking. 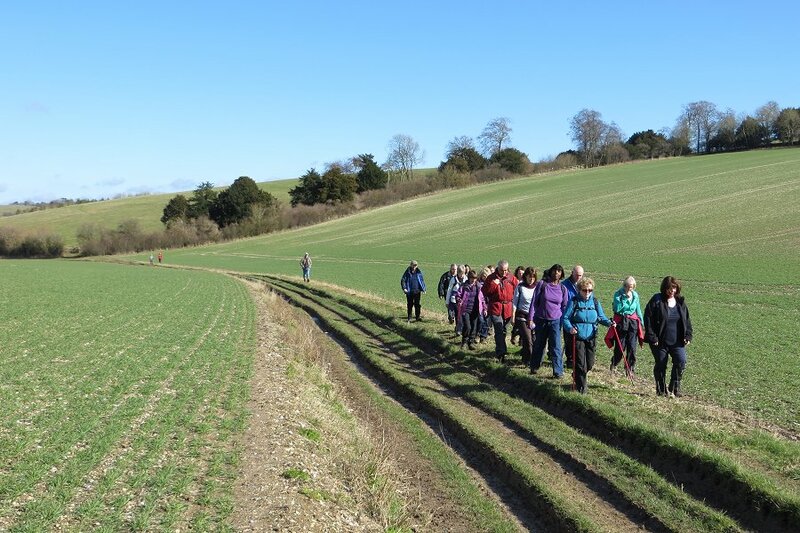 This enticed sixteen of us, including two newcomers to meet at the King William IV pub in the beautiful hamlet of Hailey, near Ipsden in South Oxfordshire for a lovely undulating walk led by Jo. It was good to see that the pub openly welcomes walkers, encouraging them to make use of their car park. 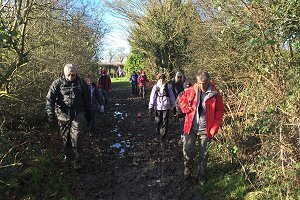 After a fortnight of dryer and warmer weather, we were confident that much of the recent mud would have dried and some of the group happily exchanged their gaiters and waterproof jackets for sun-hats and sun screen. Stopping for a drink on this sunny walk. Setting off from the pub, we soon crossed rolling farm land, heading south round Warren Hill towards Well Place and then up Berins Hill. At one point, we successfully negotiated a path across a field with a large and rather nervous herd of cows and their young. 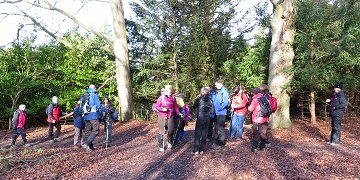 Our route included much ascent and descent so we all appreciated the drink stop which was taken looking south towards Brown’s Wood. 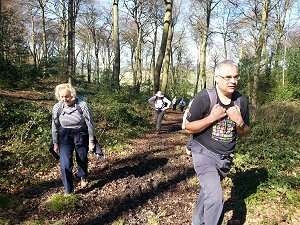 At Ipsden Heath we started to head north towards Heath End, after which we would soon meet up with the Ridgeway and our lunch stop today was in a lightly wooded area where our path crossed this long distance national trail (87 miles from Wiltshire to the Chilterns). Having a picnic lunch on the Ridgeway. 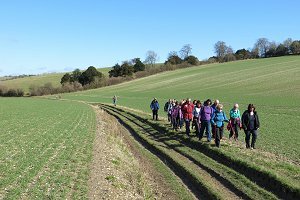 This is the second BWW walk this month that has included part of the Ridgeway and on such a beautiful spring day, it was a hive of activity. As we sat on several conveniently placed fallen trees eating our sandwiches, many cyclists passed and we saw several other walkers making the most of the lovely weather. After lunch, we followed the Ridgeway westwards, enjoying a wandering path with a screen of trees and fields stretching away on either side. After another short climb, the path emerged on the top of a man-made bank known as Grim’s Ditch which is an impressive but mysterious feature on the landscape. It’s thought that it was constructed sometime in the Iron Age and was possibly some form of boundary between different territories. Walking alongside Grim's Ditch on the Ridgeway. On returning to the popular King William IV pub, most of the group stayed for a well-earned drink. Sitting outside, we were able to enjoy the banks of golden daffodils opposite the pub and take in yet another stunning view. 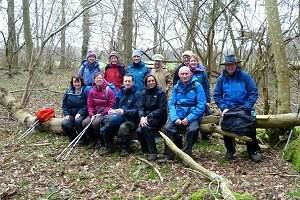 We agreed that it would be lovely for Berkshire Weekend Walkers to return to explore more of the South Oxfordshire area in the future. 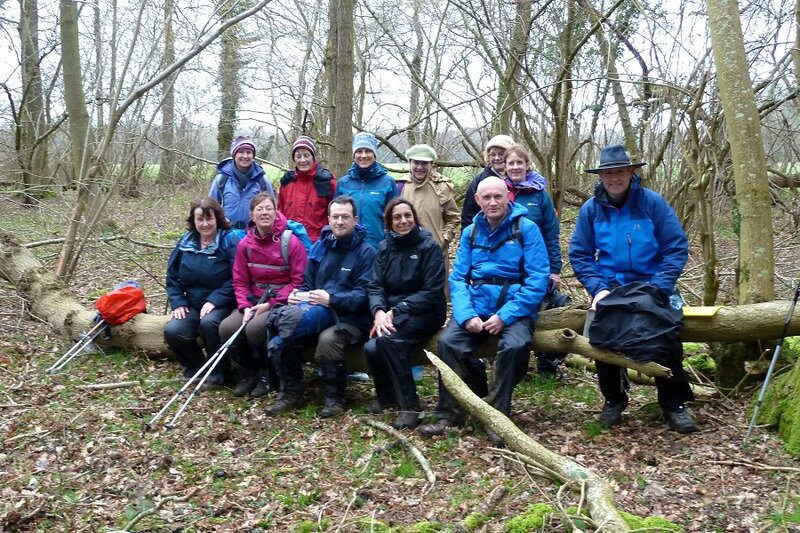 Thank you Sue for the write-up and the photographs of this walk. I didn't make it to this walk on Sunday 23rd March, which was a repeat of the New Years Day walk that had to be cancelled due to the severe bad weather. 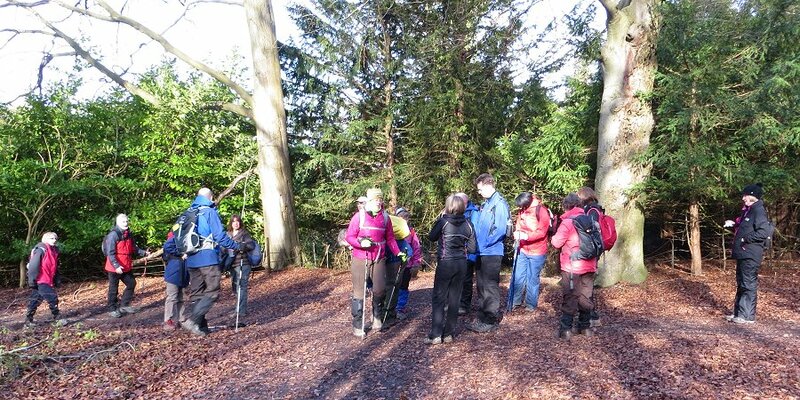 The weather was much better this time and I'm told it was an enjoyable walk with a turn-out of around 26 people! 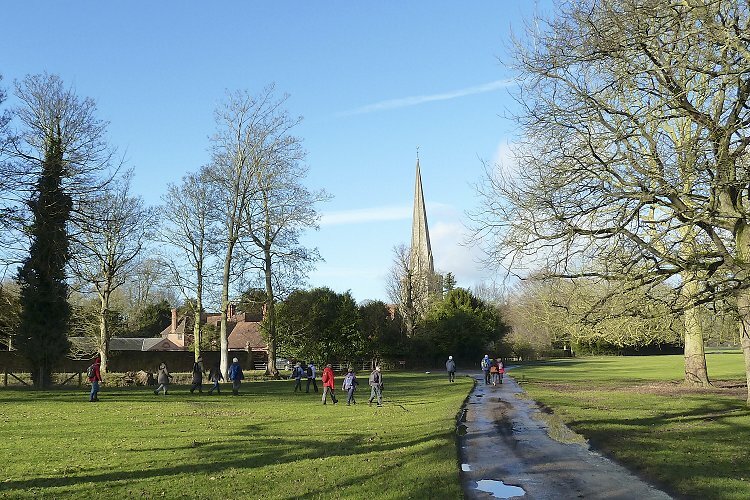 On Saturday 29th March, the picturesque village green at Tilford in Surrey was the starting point for a very sunny and pleasantly warm (15°C) walk for fifteen ramblers, fourteen of whom were regulars with Berkshire Weekend Walkers and one of whom was a visitor from another group who lived locally. Although the forecast promised uninterrupted sun for the rest of the day, some of us still packed fleeces and waterproofs in addition to sun glasses and sun hats, not quite trusting the good old British weather. 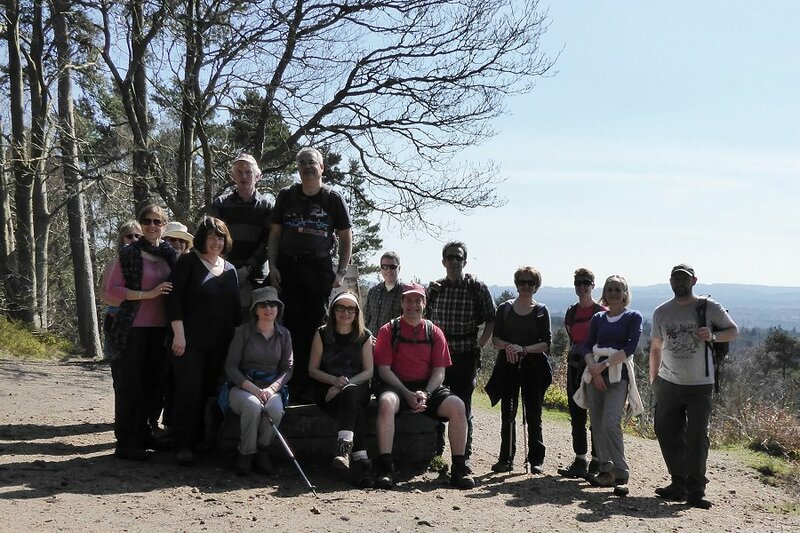 A group photo on the top of Crooksbury Hill. 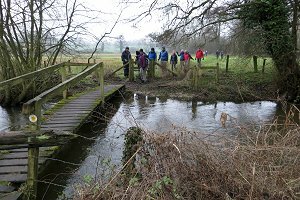 Leaving Tilford, we crossed over the River Wey before heading north east along well marked footpaths towards Crooksbury Common. The first part of the walk was a very gentle and steady ascent through beautiful coniferous woodland. 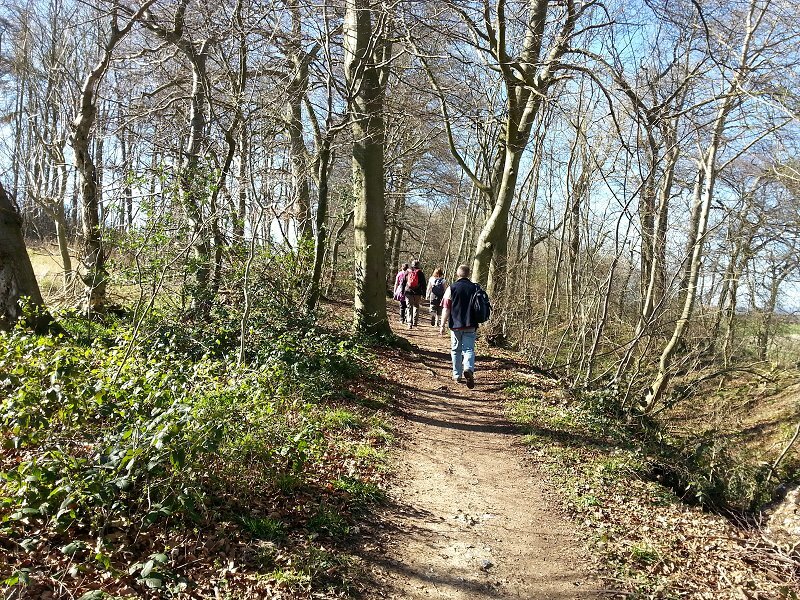 The ascent to the top of Crooksbury Hill was somewhat steeper, but we were rewarded with wonderful views over southwest Surrey, east Hampshire and across to the South Downs when we reached the top and this was to be a very pleasant location for our picnic lunch today. Descending Crooksbury Hill after our picnic lunch. After descending Crooksbury Hill, our next stop was for refreshments at the Barley Mow pub in The Sands, where we enjoyed sitting outside in their garden and basking in the glorious sunshine. 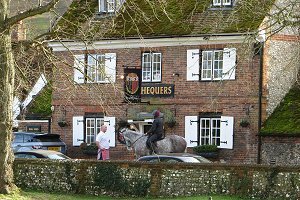 From the pub, we then walked north-west along a short stretch of road to meet up with the North Downs Way. We followed this path through the lovely nature reserve at Runfold Wood and beyond until it crossed another long distance path, the Greensand Way. Here, the Greensand Way follows the meandering River Wey, which surprisingly still showed signs of flooding from several weeks earlier. A long exposure of Mother Ludham's Cave showing detail not normally visible in the darkness. 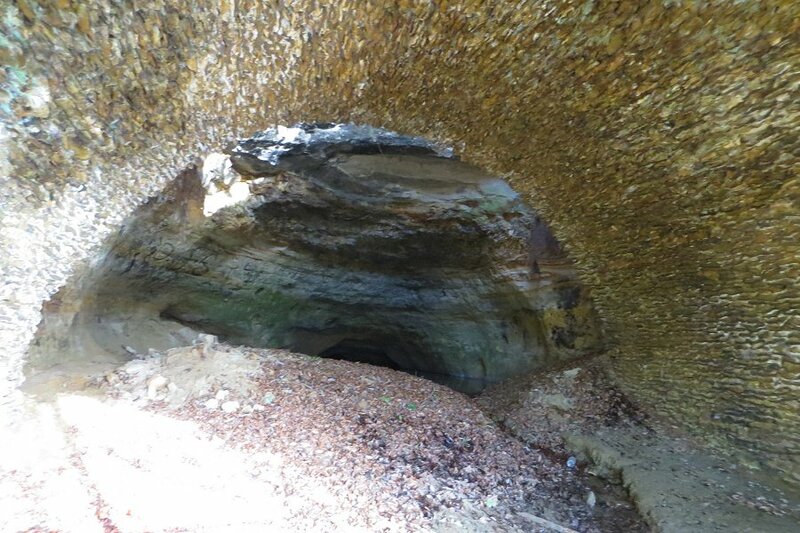 The path also passes Mother Ludlam’s Cave, a small cave naturally carved out of the sandstone cliff by a spring and which is the subject of a number of fascinating local legends involving a white witch and her cauldron! Along both paths, there were several very informative boards telling us more about this very attractive area and the local wildlife and vegetation. 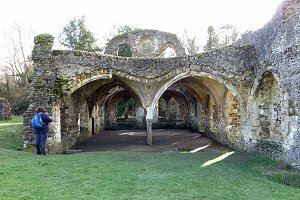 Before heading south back to Tilford, we made a small detour to visit the remains of the church and monastic buildings at Waverley Abbey, passing the elegant Georgian Waverley Abbey House on our way. Lay brothers' refectory. Part of the ruins of Waverley Abbey. 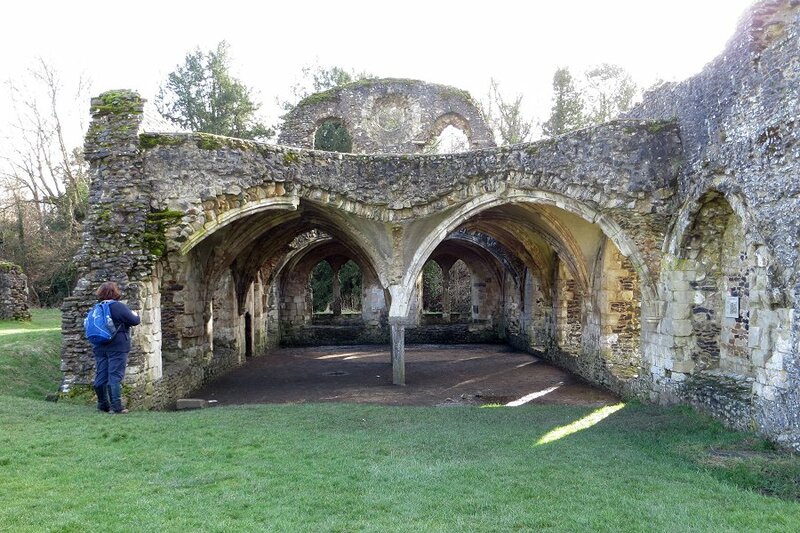 The abbey was the first Cistercian abbey in England, founded in 1128 and the group spent some time exploring the site and appreciating the scale of the ruins, particularly enjoying the vaulted ceiling of the lay brothers’ refectory. On arriving back in Tilford, most of us couldn’t resist further refreshment at our second Barley Mow pub of the day, sitting outside in the sunshine on the edge of this very quintessentially English village green. This added the finishing touch to a very enjoyable 9 mile walk! 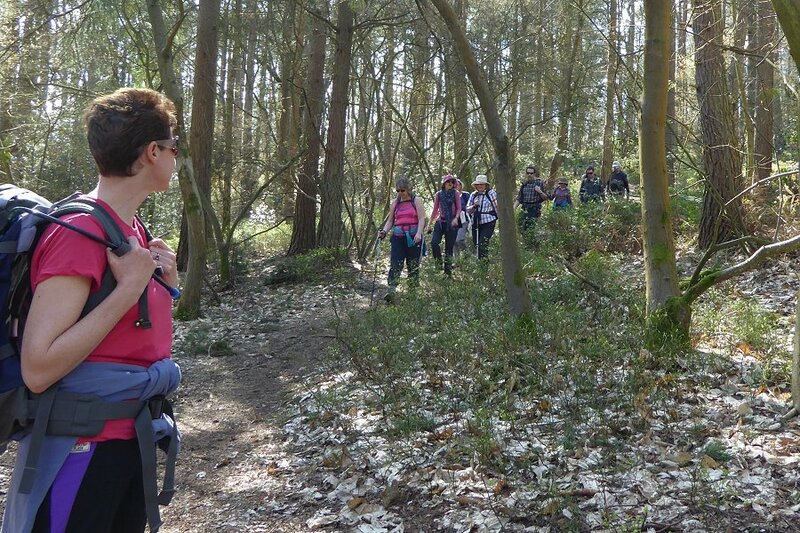 Thanks to Sue for leading this walk and providing the write-up.